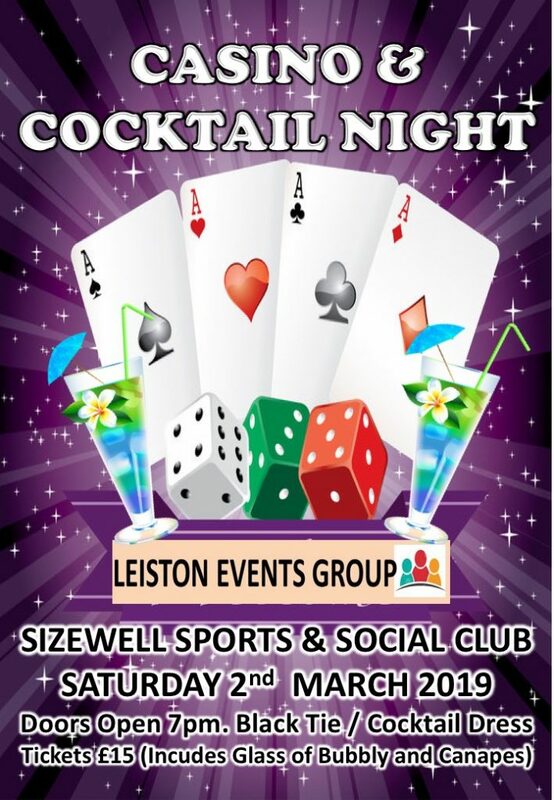 Leiston Events Group presents a ‘Casino and Cocktail’ night on 2nd March 2019 at 7pm. Ticket price of £15pp includes a glass of fizz, canapes and £100 of ‘fun money’, with live music throughout the evening from the amazing Pip Duffy. Suit up in black tie or cocktail dress. We want everyone looking the part! Red and Black Casinos will be providing a professional gaming experience (Roulette, Craps and Blackjack). The £100 ‘pretend/fun’ money included in your ticket will give you around 10 goes at playing any of the three tables. Plenty of help and guidance with be on hand for anyone who hasn’t played before. Additional fun money can be purchased on the evening at £5 for £100 of ‘pretend/fun’ money, and the player who has won the most ‘fun money’ during the evening will receive a prize at the end. Raising funds towards Leiston’s Big Weekend 2020. ← A Huge Thank You to Leiston on Ice Sponsors!